Get ready to slide sideways into Brickyard race week again in 2019! The Driven2SaveLives BC39 powered by NOS Energy Drink will return for its second running Wednesday, Sept. 4 and Thursday, Sept. 5, 2019 at The Dirt Track at IMS. The young guns of the NASCAR XFINITY Series prepare take on the veterans during practice for the Indiana 250 on Friday, Sept. 6. Once practice concludes, don't miss the popular Hauler Parade on Main Street in Speedway. There will be fun, games and face-painting for the kids, with live music, NASCAR driver appearances and the parade of gleaming, colorful NASCAR haulers down Main Street as they head toward IMS for the Big Machine Vodka 400 at the Brickyard Powered by Florida Georgia Line weekend. The popular Hauler Parade returns to Main Street in Speedway on Friday, Sept. 6, providing NASCAR fun for everyone. There will be fun, games and face-painting for the kids, with live music, NASCAR driver appearances and the parade of gleaming, colorful NASCAR haulers down Main Street as they head toward IMS for the Big Machine Vodka 400 at the Brickyard Powered by Florida Georgia Line weekend. Be there! Ready, set, Let's Brickyard! 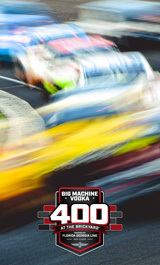 Tickets are on sale now for the Big Machine Vodka 400 at the Brickyard powered by Florida Georgia Line. The 26th edition of the historic race takes place Sept. 6-8, 2019, setting the stage for the playoffs and serving as the crowning event for NASCAR’s regular season championship. Buy your tickets now to secure your seats at the lowest prices available! The top young stars of the future in NASCAR will take on some of the biggest names in the sport in the Indiana 250 NASCAR Xfinity Series race Saturday, Sept. 7 at IMS. See who will "Kiss the Bricks" in one of the biggest races of the Xfinity Series!